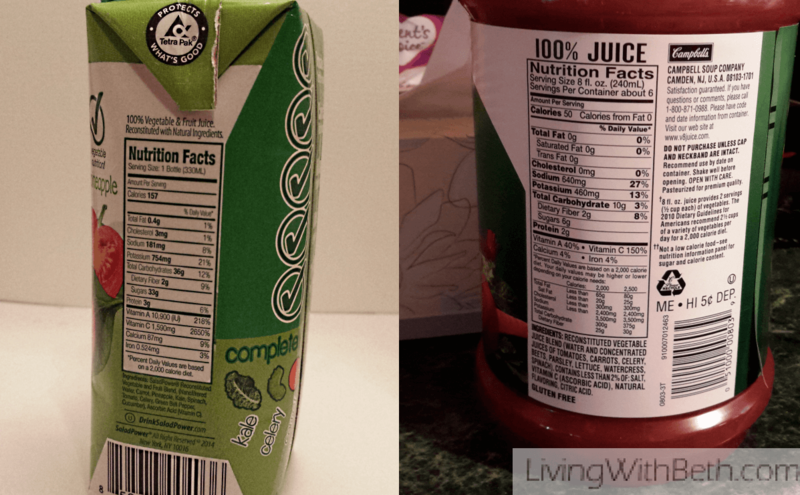 Grocery store shelves are crowded with vegetable drinks, both shelf-stable and refrigerated. When you think about a popular veggie drink, though, V8 juice probably comes to mind. Now, there’s a new player at the table. 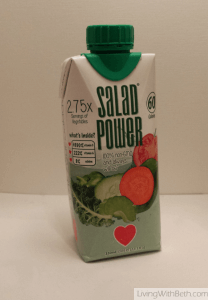 Salad Power offers 100 percent non-GMO, all natural vegetable juice products. Three of their four flavors add a touch of fruit (mango, pineapple or apple) to make them more flavorful. 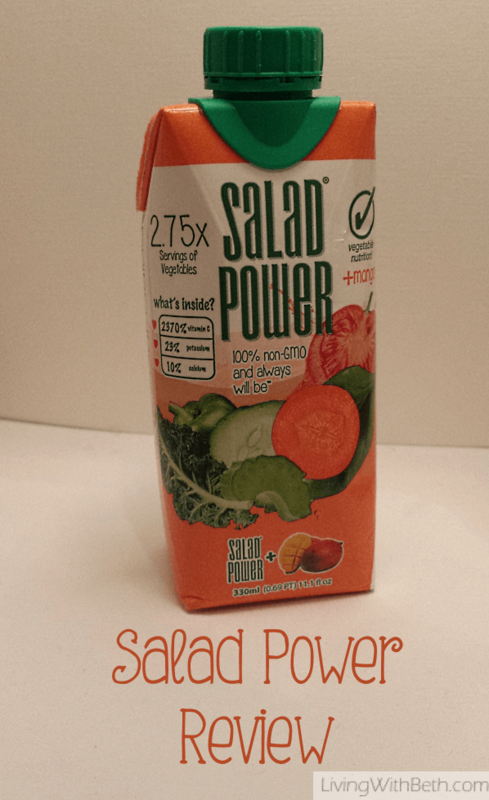 Salad Power’s basic variety, without added fruit juice, contains 60 calories per 11-ounce container, which is similar to V8 juice’s 50 calories per 8-ounce serving. One major difference between the two brands is the level of sodium. All of Salad Power’s options contain around one-third the amount of sodium found in regular V8 juice. Salad Power + Mango contains the most calories at 163, with the pineapple and apple varieties coming in at just over 100 calories each. I received sample products to use for this review, and I figured my husband would be a good tester since he likes to drink V8 juice. I’m not big on vegetable juices in general, including V8, and my two girls, ages 6 and 11, haven’t tried vegetable juices before. 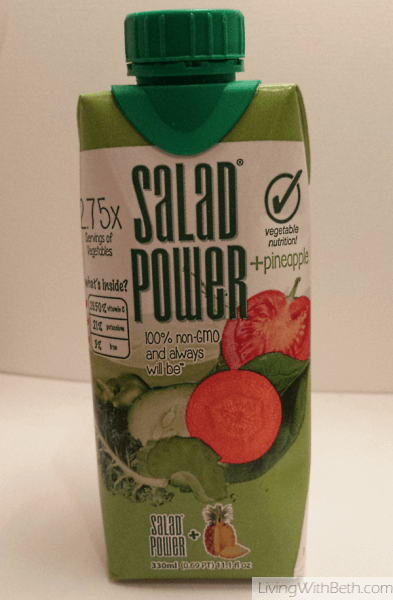 My husband and I didn’t prefer the Salad Power juice to regular V8 juice, with the exception of the pineapple variety, which I thought was a keeper. Our 6-year-old already eats a wide variety of foods, including fruits and vegetables, and she liked all of the fruity flavors of Salad Power – pineapple, mango and apple. The real shocker came with my 11-year-old, who generally avoids eating most fruits and veggies. She’ll eat the occasional carrots with dip and seems to like some of the veggies served in the school cafeteria. Otherwise, she generally turns down most fruit and vegetable offerings. Luckily, she enjoys trying new things, and she couldn’t wait to get her hands on the Salad Power. Much to my surprise, she loved the apple variety of Salad Power and begged to try the other flavors. She raved about all of the Salad Power flavors and drank down most of the sample bottles over the course of about two or three days. She kept saying how delicious they were, describing them as like someone put a salad in a blender and made a drink out of it. 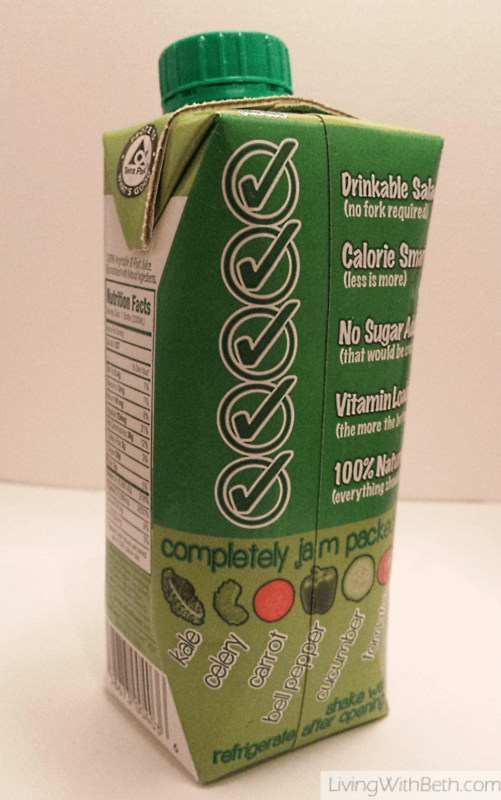 I was positively shocked that this veggie-rejecting child eagerly consumed vegetable juice over and over again. If you have a veggie rejector in your family, you may want to give Salad Power a try. The product doesn’t need refrigerated until after it’s opened, and it’s easy to re-close with its screw-top lid. You won’t find any unusual ingredients on the label, either, just things like cucumber, green bell pepper, celery, tomato, kale and vitamin C.
All of the Salad Power varieties are high in vitamin C and vitamin A. The original flavor contains 13 carbs per serving. Because they contain fruit, the other versions have more carbs – between 27 and 36 grams each. Salad Power products are 100% natural, vegan, gluten free, Kosher and non-GMO. As of now, you can only find Salad Power at select New York stores and through Amazon.com .